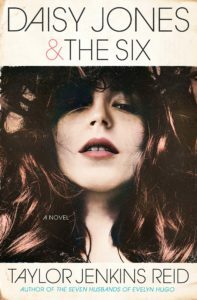 I’m not sure that the book blogosphere has ever been as excited about an upcoming novel as it is about Taylor Jenkins Reid’s Daisy Jones & The Six (release date March 5). I was lucky to get my hands on a review copy and read it because I just couldn’t wait until March. This is the fourth TJR book I’ve read in the last year and the hype had me very intrigued. Daisy Jones & The Six is a fictional oral history of a rock band from the 70s called The Six. The lead singer of The Six, Billy Dunne, was a brilliant singer and songwriter, but was dogged by addiction and his past failings. Daisy Jones, another brilliant but troubled singer and songwriter, found her way to the band, joining it for one iconic album that catapulted the group to stardom and thrust the relationship between the two singers into the spotlight. The book is told in the style of a Vulture or Rolling Stone oral history, with the story related through the words of the band members and others close to The Six. You hear everyone’s perspectives on the events that happened – the tour dates, the recording sessions, the drug binges (Daisy), the temptations (Billy), the band’s inevitable breakup and the milestones experienced by the other band members. It’s not until the end of the book that you discover who was doing the interviewing, and why. I liked Daisy Jones & The Six. The beginning felt very familiar, as it included many of the typical rock cliches that pop up on every episode of Behind The Music. Then the book got a little more surprising, as Daisy and Billy’s relationship became more complicated. The question of whether these two flawed people, who were passionately drawn to each other, would end up exploring that passion or resisting it kept me interested throughout the book. It’s easy to forget that The Six didn’t actually exist because Reid makes the book so realistic. (There are even song lyrics at the end.) Ultimately, though, I found drugs/drinking vs sobriety/commitment angle a little tiresome. So many pills, so much coke – it all kind of blurred together. And that detracted from the overall power of the story. The oral history format worked well here and made the book flow quickly. Daisy Jones & The Six is going to be a big hit, and Amazon has already ordered a 13-episode limited series co-produced by Reese Witherspoon. I promise that you will be hearing a lot about it. It was an entertaining read, and as someone who loves rock history, I enjoyed many of the backstage elements of the story.